Cavefish (without eyes) and surface dwelling brethren. "Regressive evolution," or the reduction of traits over time, is the result of either natural selection or genetic drift, according to a study on cavefish by researchers at New York University's Department of Biology, the University of California at Berkeley's Department of Integrative Biology, and the Harvard Medical School. Previously, scientists could not determine which forces contributed to regressive evolution in cave-adapted species, and many doubt the role of natural selection in this process. Darwin himself, who famously questioned the role of natural selection in eye loss in cave fishes, said, "As it is difficult to imagine that eyes, although useless, could be in any way injurious to animals living in darkness, I attribute their loss wholly to disuse." The research appears in the most recent issue of the journal Current Biology. Cave adaptations have evolved in many species independently, and each cave species can be considered a replicate of the same evolutionary experiment that asks how species change in perpetual darkness. This makes cavefish a rich source for the examination of the evolutionary process. 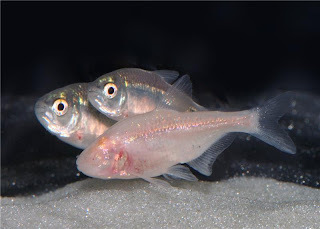 In this study, the researchers examined the genetic basis of regressive evolution in the eyes and pigmentation of Mexican cavefish. To do so, they mapped the quantitative trait loci (QTL) determining differences in eye and lens sizes as well as the melanophore--or pigment cell--number between cave and surface fish. These QTL represent genes where new mutations arose in cave populations. To better understand the genetic basis for regressive evolution, they focused on two alternative explanations for regression: natural selection, in which beneficial DNA mutations become more common over time, and genetic drift, in which the frequencies of these mutations can rise or fall over time due solely to statistical variation. Their results suggested that eyes and pigmentation regressed through different mechanisms. Mutations in cave populations that affected eye or lens size invariably caused size reductions. This observation is consistent with evolution by natural selection and inconsistent with evolution by genetic drift. By contrast, mutations in cave populations that affected pigmentation sometimes caused increases instead of decreases in pigment cell density, consistent with evolution by random processes and genetic drift. Allaying Darwin's doubts about the role of natural selection in eye loss, the researchers suggest that the high metabolic cost of maintaining the retina is the source of selection against eyes in the cave. By contrast, no such great cost is associated with pigmentation--thus, the two traits regress for different reasons.